Hit the hills of the Himalayas and spot the elusive Red Panda for big rewards in this new slot from Spin Games. This great new release has 5-reels and 4-rows that together offer 1024 ways to win. Aside from a wild symbol that can be found on reels 2, 3 and 4, the game also offers free spins and a Wheel Power Game. With an RTP of 96.0%, you'll be climbing your way to huge Himalayan prizes in Red Panda! 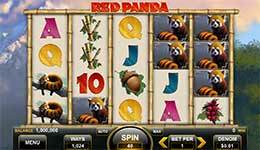 Hit the hills of the Himalayas and spot the elusive Red Panda for big rewards in this new slot from Spin Games. This great new release has 5-reels and 4-rows that together offer 1024 ways to win. Aside from a wild symbol that can be found on reels 2, 3 and 4, the game also offers free spins and a Wheel Power Game. With an RTP of 96.0%, you’ll be climbing your way to huge Himalayan prizes in Red Panda! Wild Symbol – The Wild symbol is the game logo and can be found on reels 2, 3 and 4. It will substitute for all other symbols in the game except the free games scatter and Wheel Power symbol. Free Games Feature – Land 3, 4 or 5 free game scatters in the primary game to win 8, 15 or 20 free games respectively. Free spins are played at the same bet multiplier as the primary game that triggered the feature. Each wild that appears on screen multiplies any award amounts by either 2x or 3x for that spin. Additional free spins can be won. Wheel Power Game – Land 2 Wheel Power symbols on reels 1 and 5 to trigger the Wheel Power bonus. Spin the double layered wheel to win credit prizes and the possibility for additional prizes.